ProRes is a lossy video compression format developed by Apple Inc. for use in post production that supports any frame size (including SD, HD, 2K, 4K, and 5K) at full resolution. It is the successor of the Apple Intermediate Codec and was introduced in 2007 with Final Cut Studio 2. The data rates vary based on codec type, image content, frame size, and frame rate. The Apple ProRes format comes in five versions: Apple ProRes 4444, Apple ProRes 422 (HQ), Apple ProRes 422, Apple ProRes 422 (LT), and Apple ProRes 422 (Proxy). The following list describes the features of each version. An extremely high-quality version of Apple ProRes for 4:4:4:4 image sources (including alpha channels). This codec features full-resolution, mastering-quality 4:4:4:4 RGBA color and visual fidelity that is perceptually indistinguishable from the original material. Apple ProRes 4444 is a high-quality solution for storing and exchanging motion graphics and composites, with excellent multigeneration performance and a mathematically lossless alpha channel up to 16 bits. This codec features a remarkably low data rate compared to uncompressed 4:4:4 HD. It has a target data rate of approximately 330 Mbps for 4:4:4 sources at 1920×1080 and 29.97 fps. It also offers direct encoding of and decoding to both RGB and Y’CBCR pixel formats. A higher-data-rate version of Apple ProRes 422 that preserves visual quality at the same high level as Apple ProRes 4444 but for 4:2:2 image sources. With widespread adoption across the video post-production industry, Apple ProRes 422 HQ offers visually lossless preservation of the highest-quality professional HD video that a single-link HD-SDI signal can carry. This codec supports full-width, 4:2:2 video sources at 10-bit pixel depths, while remaining visually lossless through many generations of decoding and reencoding. The target data rate is approximately 220 Mbps at 1920×1080 and 29.97 fps. A high-quality compressed codec offering nearly all the benefits of Apple ProRes 422 HQ, but at 66 percent of the data rate for even better multistream, real-time editing performance. The target data rate is approximately 147 Mbps at 1920×1080 and 29.97 fps. A more highly compressed codec than Apple ProRes 422, with roughly 70 percent of the data rate and 30 percent smaller file sizes. This codec is perfect for environments where storage capacity and data rate are at a premium. The target data rate is approximately 102 Mbps at 1920×1080 and 29.97 fps. An even more highly compressed codec than Apple ProRes 422 LT, intended for use in offline workflows that require low data rates but full-resolution video. The target data rate is approximately 45 Mbps at 1920×1080 and 29.97 fps. With the Apple ProRes format, you can work in a wide variety of frame sizes, frame rates, bit depths, and even color sample ratios. 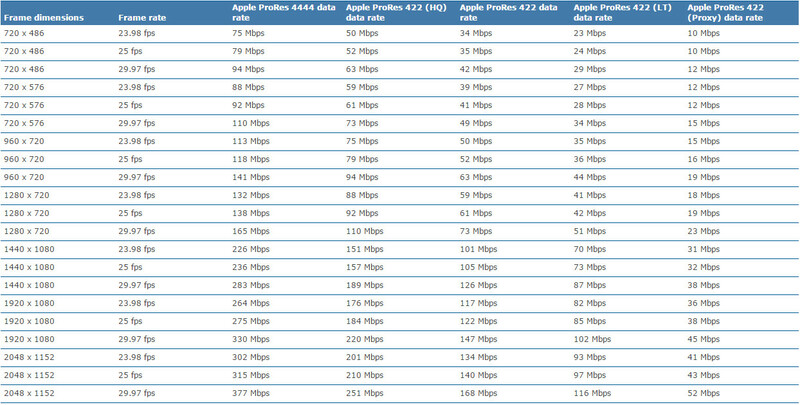 For a complete comparison of the relative data rates of the Apple ProRes codecs, see the chart below. The Apple ProRes format supports both interlaced and progressive scan images and preserves the scanning method used in the source material. The actual data rate of Apple ProRes codecs depends on the dimensions, frame rate, image complexity, and quality setting you are using. The Apple ProRes format has a target data size for every frame, regardless of complexity, but allows frames to fall short of that target if they are simple (if they cannot benefit in quality from using more bits). Such a shortfall is not reclaimed for other frames; instead, it just produces a smaller overall file. The following table shows several sample data rates. The Apple ProRes codecs are designed to target the data rates shown. Because most sequences contain simple frames, actual bit rates are typically 5 to 10 percent lower than these targets. Looking for a ProRes Converter for Mac? If you want to convert your video footage to ProRes for smoothly editing on Mac OS X, Brorsoft Video Converter for Mac is highly recommended. This program features high efficiency and seamless conversion. With it, you can do batch conversion from AVCHD, MTS, AVI, VOB, MP4, MOV, and more to ProRes in simple clicks of mouse.